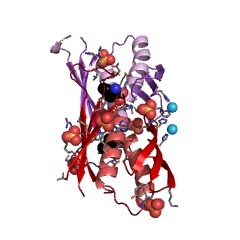 This is the C-terminal regulatory (R) domain of alpha-isopropylmalate synthase, which catalyses the first committed step in the leucine biosynthetic pathway (PUBMED:15159544). This domain, is an internally duplicated structure with a novel fold (PUBMED:15159544). It comprises two similar units that are arranged such that the two -helices pack together in the centre, crossing at an angle of 34 degrees, sandwiched between the two three-stranded, antiparallel beta-sheets. The overall domain is thus constructed as a beta-alpha-beta three-layer sandwich (PUBMED:15159544). This is the C-terminal regulatory (R) domain of alpha-isopropylmalate synthase, which catalyses the first committed step in the leucine biosynthetic pathway [(PUBMED:15159544)]. 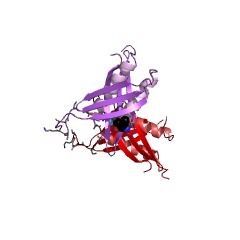 This domain, is an internally duplicated structure with a novel fold [(PUBMED:15159544)]. It comprises two similar units that are arranged such that the two helices pack together in the centre, crossing at an angle of 34 degrees, sandwiched between the two three-stranded, antiparallel beta-sheets. The overall domain is thus constructed as a beta-alpha-beta three-layer sandwich [(PUBMED:15159544)]. There are 26687 LeuA_dimer domains in 26605 proteins in SMART's nrdb database. Taxonomic distribution of proteins containing LeuA_dimer domain. This tree includes only several representative species. The complete taxonomic breakdown of all proteins with LeuA_dimer domain is also avaliable. Click on the protein counts, or double click on taxonomic names to display all proteins containing LeuA_dimer domain in the selected taxonomic class. Crystal structure of LeuA from Mycobacterium tuberculosis, a key enzyme inleucine biosynthesis. The leucine biosynthetic pathway is essential for the growth ofMycobacterium tuberculosis and is a potential target for the design of newanti-tuberculosis drugs. The crystal structure of alpha-isopropylmalatesynthase, which catalyzes the first committed step in this pathway, hasbeen determined by multiwavelength anomalous dispersion methods andrefined at 2.0-A resolution in complex with its substratealpha-ketoisovalerate. The structure reveals a tightly associated,domain-swapped dimer in which each monomer comprises an (alpha/beta)(8)TIM barrel catalytic domain, a helical linker domain, and a regulatorydomain of novel fold. 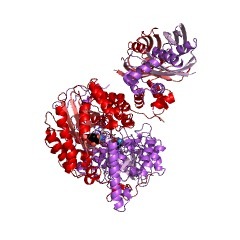 Mutational and crystallographic data indicate thelatter as the site for leucine feedback inhibition of activity. Domainswapping enables the linker domain of one monomer to sit over thecatalytic domain of the other, inserting residues into the active sitethat may be important in catalysis. The alpha-ketoisovalerate substratebinds to an active site zinc ion, adjacent to a cavity that canaccommodate acetyl-CoA. Sequence and structural similarities point to acatalytic mechanism similar to that of malate synthase and an evolutionaryrelationship with an aldolase that catalyzes the reverse reaction on asimilar substrate.